Lindholm’s main research topics cover interdisciplinary projects on exotic viral diseases in animals. DTU Vet carries out basic and applied research aiming to control and prevent infectious animal diseases, including exotic virus diseases like foot and mouth disease (FMD), classical swine fever (CSF), African swine fever (ASF). At Lindholm, research projects can be carried out in a friendly, international atmosphere characterised by a high scientific level. Lindholm has an outbred swine herd with a unique, high sanitary status, i.e. free from PCV2, PRRS, Influenza, mycoplasms, Lawsonia etc. These pigs, which will be available for infection experiments, are particularly adequate for immunological studies. Lindholm will provide laboratories well-equipped for virology, molecular biology and immunology, e.g. flow cytometry. 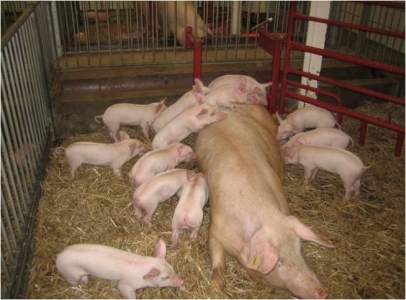 BSL3 animal facilities are available for infection experiments in pigs, e.g. Swine fever, PRRS and Influenza. For FMD research, a new BSL3+ unit, laboratories and 2 animal units for swine or ruminants is available. A large cell culture facility ensures the availability of a wide range of primary cell cultures and cell lines. Internationally recognised scientist will take part in the projects, and all the necessary support will be provided by English speaking laboratory technicians and well-trained staff in the animal care unit. The duration of the project periods may be 4 – 8 weeks. For each project, we welcome 2 participants. Travel and accommodation costs covered per participant will be within a limit of 600€ and 20€ per day, respectively. Accomodation may be provided at the island of Lindholm. Belsham, G.J., Normann, P., 2008. Dynamics of picornavirus RNA replication within infected cells. J. Gen. Virol. 89, 485-493. Bruun, C. B., Jørgensen, C. B., Bay, L., Cirera, S., Jensen, H. E., Leifsson, P.S., Nielsen, J., Christensen, K., Fredholm, M., 2008. Phenotypic and genetic characterization of a novel phenotype in pigs characterized by juvenile hairlessness and age dependent emphysema. BMC Genomics, 9:283. Lohse, L., Bøtner, A., Hansen, A.-S. L., Frederiksen, T., Dupont, K., Christensen, C. S., Bækbo, P., Nielsen, J.: Examination for a viral co-factor in Postweaning Multisystemic Wasting Syndrome. Vet. Microbiol. 2008, 129, 97-107. Nielsen, J., Bøtner, A., Tingstedt, J.E , Aasted, B., Johnsen, C.K, Riber, U., Lind, P., 2003. In utero infection with porcine reproductive and respiratory syndrome virus modulates leukocyte subpopulations in peripheral blood and bronchoalveolar fluid of surviving piglets. Vet. Immunol. Immunopathol., 93: 135-151. Nielsen, J., Vincent, I.E., Bøtner, A., Ladekjaer-Mikkelsen, A.S., Allan, G., Summerfield, A., McCullough, K.C., 2003. Association of lymphopenia with porcine circovirus type 2 induced postweaning multisystemic wasting syndrome (PMWS). Vet. Immunol. Immunopathol. 92, 97-111. Rasmussen, T.B., Reimann, I., Hoffmann, B., Depner, K., Uttenthal, Å., Beer, M.,2008. Direct recovery of infectious Pestivirus from a full-length RT-PCR amplicon. J. Virol. Meth., 149(2): 330-333. De Vleeschauwer, A., Atanasova, K., Van Borm, S., van den Berg, T., Rasmussen, T.B., Uttenthal, Å., Van Reeth, K., 2009. Comparative Pathogenesis of an H5N2 Avian and an H1N1 Swine Influenza Virus in Pigs. PLOS pathogens, 4/8: e6662.